Listed below are the ferry and hovercraft services operating between Portsmouth, Ryde and Fishbourne on the Isle of Wight. 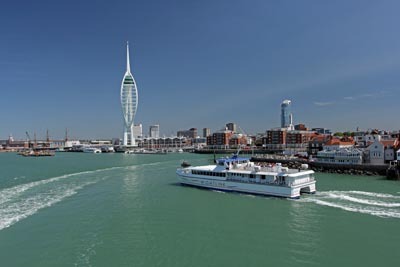 There is a variety of services operating between Portsmouth and the Isle of Wight, offering car ferry, passenger catamaran and hovercraft crossings. The fastest crossing to the Isle of Wight is by Hovercraft from Southsea to Ryde, the crossing only takes 10 minutes, this service is passenger only. Please note: This site has no association with any of the transport operators or organisations shown. Any information shown will require further confirmation before it is used for travel. The car ferry is operated by Wight Link and operates from the ferry terminal at Gunwharf Road, close to Gunwharf Quays, to Fishbourne on the IOW. The crossing takes around 40 minutes, the ferry also carries foot passengers and cyclists. Address: Car Ferry Terminal, Gunwharf Road, Portsmouth, PO1 2LA. The passenger catamaran operated by Wightlink, runs from the railway jetty at The Hard Interchange, Portsmouth, to Ryde Pier, Isle of Wight. Cycles are also carried on this route. The crossing takes approximately 22 minutes. This crossing provides good connections to rail, coach and bus connections both in Ryde and Portsmouth. Address: Portsmouth Harbour Station, The Hard, Portsmouth, PO1 3PS. The hovercraft service operating from Portsmouth (Southsea Seafront) to Ryde offers the fastest Solent crossing time, making the journey in approximately 10 minutes. Hovertravel also operates a connecting bus service, Hoverbus, running between the Southsea Hovercraft Terminal and Gunwharf Quays. The journey takes under ten minutes and runs every half an hour between 06:15 and 21:00, and also a 22:00 late crossing during summer months. Address: Hovertravel Limited (Southsea), Clarence Esplanade, Southsea, PO5 3AD.